HOUSTON — Tom Brady raved about Rob Gronkowski after he helped New England rally for a 34-31 win over the Houston Texans on Sunday. The tight end had six receptions for 127 yards and a 23-yard touchdown. 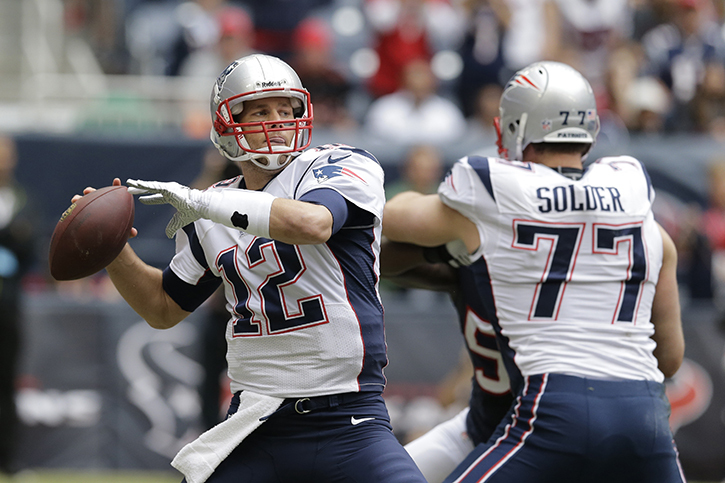 Brady used a 50-yard pass to Gronkowski to get New England to the Houston 13 early in the third quarter. James Develin was hit by four Texans, but kept his feet moving and plunged into the end zone for a 1-yard score to cut the lead to 17-14. He and Brady were disappointed that the Patriots had to rally for a second straight week. “We’ve got to start playing better football in the first half, and come out with a better start, and move the ball better,” Gronkowski said. Gronkowski has gotten into a groove after missing the first six games after offseason surgery on his back and broken left forearm. He has 560 yards receiving this season and has a touchdown in four straight games. Gronkowski has 12 100-yard receiving games in his career, which is the most for a New England tight end. Three of those games have come this season. His touchdown on Sunday was the 42nd of his career, which ties him for fourth-most touchdown receptions in New England history. He credited Brady’s demeanor for helping the Patriots overcome another first-half hole on Sunday. • SPYING? Houston defensive end Antonio Smith questioned how New England knew what the Texans were going to do on defense on Sunday. Smith told reporters after the game Houston had some new wrinkles in its defense this week and it was “miraculous” how the Patriots changed their offense to key on the defense. The NFL fined New England coach Bill Belichick $500,000 and the team $250,000 and took away a first-round pick in the 2008 draft for videotaping New York Jets signals during a game on Sept. 9, 2007. Belichick said he thought that was allowed and apologized for what he said was a mistake in his interpretation of the rule prohibiting it. • TERRIFIC TATE: Houston running back Ben Tate bounced back from gaining just 1 yard on seven carries last week for his first 100-yard game since 2011. Tate, who has been slowed since Oct. 20 with four broken ribs, ran for 102 yards and three touchdowns for the Texans, who haven’t won since Sept. 15. Houston had just two rushing touchdowns this season before Sunday as the team has dealt with a season-ending injury to Arian Foster and Tate’s health issues. • GOSTKOWSKI’S BIG DAY: New England’s Stephen Gostkowski hadn’t missed a field goal in 21 attempts entering Sunday’s game. He had a 55-yard attempt sail wide right in the second quarter to end the second longest streak in team history. But he bounced back to make two 53-yard field goals in the fourth quarter to give New England the win. He also made four extra points against Houston to move into third place in NFL history with 350 consecutive extra points. • ANDRE’S MILESTONE: Andre Johnson had eight receptions for 121 yards on Sunday to become the 15th player in NFL history to reach 900 receptions. He did it in his 150th career game, making him the second fastest to reach the mark behind Marvin Harrison, who did it in 149 games. • RUNNING BACK BY COMMITTEE: New England didn’t miss starting running back Stevan Ridley, who was not active after having fumble problems recently. They started Shane Vereen, but also used Develin, Brandon Bolden and LeGarrette Blount. Blount had 44 yards rushing and a touchdown, Vereen had 38 yards rushing and Develin had 4 yards rushing with a touchdown. NOTES: New England was not called for a penalty. The Patriots did the same thing on Oct. 6 in a loss at Cincinnati … Houston had four touchdowns rushing Sunday after entering the game with two this season.